By anyone’s estimations, it’s not been the easiest year to be a farmer on the Orkney islands. An exceptionally long winter was followed by a cold, wet spring and summer, which resulted in one of the shortest growing seasons in recent memory. With fears over having enough feed and bedding to get through the winter, it could be a tough few months ahead for many of the islands’ producers. And with a large proportion of Orkney’s farmland being farmed as organic, could life be even more difficult for farmers there? Currently around 30 of Orkney’s 2,100 agricultural holdings are registered as organic, with about 18,500 acres of land managed under organic certification. The majority of organic producers farm beef, sheep or both. The tough terrain and difficult weather can make growing crops difficult at the best of times, but in a bid to be as self-sufficient as possible many grow their own forage, barley and oats to feed their cattle. Bringing as little as possible from outside is a vital part of being a profitable organic farm in Orkney, says Elizabeth Bown, who farms organic beef and sheep with her husband, Tony, on their 950-acre New Holland Farm. “The premium for organic meat is quite variable,” said Mrs Bown. “What makes the biggest impact farming this way is that the input costs are hugely reduced. While costs may be lower, working without artificial fertilisers requires a close understanding of the islands’ often difficult soils and terrain, and how to get the best from it – something Mrs Bown admits was difficult when the couple first began organic conversion in 1999. “A lot of people converted at the same time as us, but we were one of the biggest farms to convert,” she said. “We were given a rule book which had half a page on upland beef and sheep farms. It talked about calving 18 cows a month, something we could do in a day. To help get a better understanding, the couple began to read everything they could on organic farming, mostly in books from America. They found that many of them dealt with soil testing and how the balance of the soil ultimately impacts upon livestock. Realising they needed to work more closely with the soil, they sampled the entire farm. It’s been a positive move, helping them grow more and better quality grass – something which has proved vital this year. “We normally finish all of our cattle but we sold more of them earlier this year to make sure we had enough silage,” she added. “But actually we have done OK in terms of the amount and quality of grass we have grown. The aeration means the land was able to drain quickly so we didn’t have an issue with compaction either and the cattle were able to stay out until the end of November. Being as self-sufficient as possible is something which is important for all farmers on the island, but particularly for organic producers who have to contend with higher costs of organic feed on top of the already hefty haulage costs. 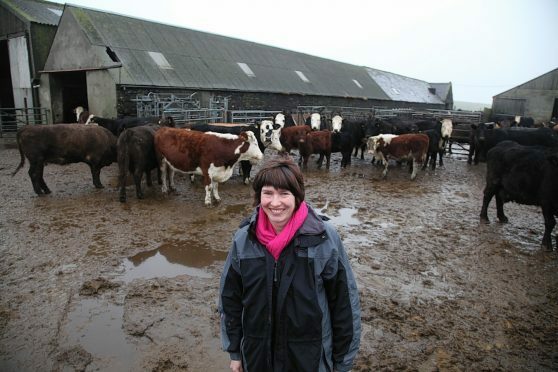 Mrs Bown said: “Any inputs that are brought on to the farm are incredibly expensive, much more than they would be for other farmers, so it helps that we can be self-contained. While bringing things to Orkney is one challenge, organic farmers can often face a similarly difficult time getting produce off the islands. Orkney’s abattoir closed down in 2012, and while a consortium of local butchers fought to reopen it, it primarily only produces meat for local homes and businesses. Now the majority of producers sell their stock fat to McIntosh Donald’s Portlethen plant or to store buyers in Aberdeenshire. Mrs Bown said: “We don’t have a choice for the market, which showed up this year. To sell as organic we have a choice of one or two buyers.